39 posts categorized "Media Trends"
Adults are much less likely than teens to have a profile on a social network website. About three in ten (35%) adult internet users age 18 and older have a profile on a social networking site like MySpace, Facebook or LinkedIn. Meanwhile, teenagers are roughly twice as likely as adults to use these sites: among teens 12 to 17 years old, 65% have a profile on an online social network. Despite comparatively lower levels of social network use, usage of social network sites by adults has increased markedly over the past four years. Overall, adults tend to use social networks for personal reasons more than professional ones (89% primarily use them to stay in touch with friends) … Among adults, MySpace is the most popular online social network. Half (50%) of adult social network users age 18 and older are on MySpace, while 22% of adult social network users have an account on Facebook. Another 6% have an account on LinkedIn, 2% have an account on Yahoo, and 1% each have accounts on YouTube and Classmates.com. Another aggregate 10% of adult online social network users have profiles on other sites, including BlackPlanet, Orkut, Hi5 and Match.com. More from A. Lenhart, Adults and social network sites. Pew Internet and American Life Project. More from A. Lenhart, Twitter and status updating. Pew Internet and American Life Project. ...as well as the popularity of specific sites. Many nonprofit and public agencies hope and pray that reporters will cover their issue, mention their specific agency (or not!) and maybe even source a quote from their staff. Media outreach or media relations are usually part of the communications mix (the PR function) for these organizations. Applying some marketing know-how to better understand and serve this priority audience, and not simply blast faxes or emails at them, is something I find few organizations spend much time thinking about or working on (see who is critical for success?). By now you probably know that many reporters find their stories and background information on the internet just like everyone else. If you don't have an internet presence, you are already at a great disadvantage for media coverage. If you do have a website and use it for media relations, you are likely doing much of it wrong. Or at least that is what Jakob Nielsen concludes from three years of research with 40 journalists from around the world. Locate a PR contact (name and telephone number - always give them a 'live option'). Find basic facts about the company (the official name of the organization, spelling of an executive's name, his/her age, headquarters location, and so on). Discern the company's spin on events (it's important that all of your press releases are posted in a clearly marked area of your site and are kept up-to-date). Check financial information (budgets are important, regardless of the sector you work in). Download images to use as illustrations in stories (be sure your logo is easily downloadable and reproducible, invest in charts and graphs that tell your story, avoid pdf). Journalists repeatedly said that poor website usability could reduce or completely eliminate their press coverage of a company. For example, after having a difficult time using a site, one journalist said: "… I would be reluctant to go back to the site. If I had a choice to write about something else, then I would write about something else." And his book that tells all: Designing Websites to Maximize Press Relations. The story is about entertainment and mobile; the facts underlying it are important for you to understand. Laura Holson reports in the NYT on how the relentless pursuit of information about celebrities has washed over the mobile landscape. Anyone can become part of the paparazzi with their mobile phone and instantly upload their celebrity siting to various websites. Celebrity gossip, entertainment news, text alerts and live red carpet broadcasts can be instantly accessed from your mobile device as well ...as smartphones, with their faster connections and improved graphics, became more popular, particularly among women, People.com explored the idea this year of retooling its Web site to make it more user friendly for owners of BlackBerrys and iPhones. People, like several news organizations, including its rival E!, is creating a specific application for the iPhone dedicated to celebrity news. Getting beyond the tactics, she quotes these factoids - for your consideration. One of the most popular mobile sites for celebrity news is Yahoo Entertainment, which recently had 2.9 million visitors, according to Nielsen. Lee Ott, global director of Yahoo’s mobile search strategy and services, said that 4 out of every 10 people used oneSearch, Yahoo’s mobile service, to find entertainment and celebrity news. By contrast, Yahoo Sports had 2 million visitors and Yahoo Finance had 1.5 million, Nielsen reported. Such services are at the intersection of two powerful demographic trends: the young are entertainment obsessed, and they are addicted to their mobile phones. Verizon Wireless estimates that two years ago, mobile content was consumed mostly by cellphone users older than 25 years old. Today that figure is more like 34 years old. New mobile phones are coming to market that are making it even easier for people to have instant access to information they want when and where they want it - the iPhone may have accelerated the trend of people using their phones to access the web. “We are getting past the early adopters and attracting a more mainstream audience,” said John Najarian, executive vice president for digital media and business development for the Comcast Entertainment Group, the division of Comcast that owns E! I recently learned that the CDC has it first pages up on a new mobile site. Is that the future of public health, health communications and social marketing, or are we simply trying to catch up with people's present reality? Nearly half of all PSAs aired on US television stations in 2005 ran between midnight and 6AM, reinforcing the true meaning of the acronym. The finding is from the Kaiser Family Foundation report released today: Shouting To Be Heard (2): Public Service Advertising in a Changing Television World. Perhaps more sobering for the true believers in PSAs is that this figure has not significantly changed since 2000 and is part of the total of 0.5% of airtime given to communications for the public good. Further evidence of the deterioration of Public Service Advertising is that the report now distinguishes between 'donated' PSAs and 'paid' ones (only 27% of those run after midnight and 51% are by for-profit companies). One in five donated PSAs (20%) specifically addressed a local issue, cause or event, while 80% were national in scope. English-language broadcast stations assessed by the study (ABC, CBS, Fox, and NBC) donated an average of 18 seconds an hour to PSAs. The cable stations (CNN, ESPN, MTV, Nickelodeon, and TNT) donated an average of 15 seconds an hour. The Spanish language network (Univision) donated an average of 29 seconds per hour to PSAs. (The overall average across all types of stations was 17 seconds an hour). Health was the most common PSA topic, accounting for 26% of all donated PSAs. A wide variety of health issues were addressed, with the most frequent being fitness (6% of all donated PSAs), cancer (4%), HIV/AIDS (3%), and overall wellness (3%). Fund-raising was a close second at 23%. Environmental issues accounted for 4% of all donated PSAs. Eight percent of all donated PSAs specifically targeted children or teens. Two percent specifically targeted seniors. The proportion featuring a Web address increased from 32 percent in 2000 to 75 percent in 2005, while the proportion with a toll-free telephone number decreased from 49 percent to 38 percent over the same period. Nonprofits were the most common sponsors of donated PSAs (71% were sponsored or co-sponsored by a nonprofit). More than a third (38%) of all spots listed a media company as a sponsor or cosponsor. Government agencies sponsored or co-sponsored 15 percent of all donated spots, with for-profit companies co-sponsoring eight percent of all donated spots. 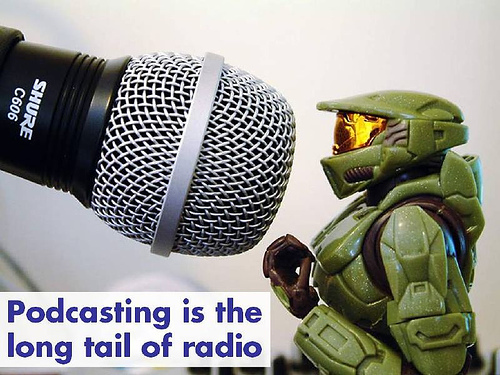 The report notes that while the debate has raged for years over requiring broadcasters to dedicate a certain amount of time to communications for the public good in return for their access to public airwaves (say 1min/hour compared to the current 17 seconds), one might expect this issue to spillover into new media and mobile phones in the next few years. A viewer would have to watch more than 200 hours of television before they’d see even a single hour of donated PSAs; and during that time, they’d see more than 50 hours of ads and promos...This report offers a sobering reminder to national and local nonprofits that relying solely on donated PSAs on television may provide neither the reach nor the frequency that public education campaigns need. And the Ad Council, the industry-supported and largest producer and distributor of PSAs reported revenues in 2007 of $38.7 million. Not bad for a questionable approach to affect positive social change. Following on the comments of the CMO of P&G at the AAAA meeting, Mich Mathews, senior vice president of Microsoft's central marketing group, also planted the MS flag firmly in the audience generated content space. She noted that 3% of their marketing budget is dedicated to exploring the potential and value of emerging media channels, stating that by 2010 the majority of their media mix will be digital. Currently, tests are being done on mobile and IPTV in Europe, interactive and out-of-home in Asia, and satellite radio and RSS feeds in the U.S.
Mathews hammered home the message that the days of pushing ads and announcements at consumers are behind us. Instead, there is a need for a push strategy centered on involving consumers in a brand. That mantra has become so critical that it is taken into consideration when creating TV spots and other video ads, particularly for the company's Xbox 360. Providing content that consumers can take ownership of via mashups and other tinkering is key. "It's now a factor in the creative process," Mathews said. Maybe that should be an 'engagement' or at least a 'pull' strategy? I'll put my hammer down for the week. Procter & Gamble's Jim Stengel described a major cultural shift that is turning the world's largest marketer into a starter of conversations and a solver of consumers' problems rather than a one-way communicator. "It's not about telling and selling," said the chief marketing officer of the company that once lived by that simple mantra. "It's about bringing a relationship mind-set to everything we do." ...And there were plenty of references to the need to understand all such two-way, community-oriented technologies, as Mr. Stengel noted that his travels to Korea have shown him the potential for the "complete irrelevance of what we call traditional media." This could be noted as the day that the cluetrain manifesto went mainstream, personal and public among some of the most influential marketers on the planet. Another credible 'reason why' and corporate model for you to use when explaining the need to get into the social media space to your colleagues, managers and funders. A starter of conversations and a solver of people's problems - not a bad platform! Imagine the ability to create your own multi-media campaigns from professionally developed source materials that you then customize to your local situation, weather conditions and even the live action on a television show before the commercial break. This evolution to virtual advertising and marketing, think enabling user-generated productions by campaign and program managers, is now going prime time. Several companies are offering automated ad creation over the Internet and, in some cases, ad placement services that all advertisers can use to more tightly focus their marketing. 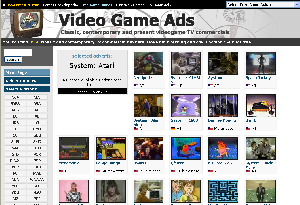 Advertisers use the new sites to select scenes from commercial films and customize campaigns with a few clicks of the mouse and little human interaction, often for a low flat fee. Imagine that your issue is the focus of a national social marketing campaign by a government or nonprofit agency. Rather than being handed prerecorded PSAs, pdf files and the like, instead you are given access to the content itself with the freedom to customize it as you like, combine it with your own content, and distribute it in ways that fit the openings of your local priority audiences. Now that sure beats the passive and reactive posture many of us have found ourselves in when national campaigns suddenly 'show up' in our markets with no obvious hooks to our agencies or context. But, will these national organizations and their advertising and PR agencies be willing to give up that much control? Not until we ask. Take a tour of what could be in your future. This site is for car dealerships right now; here's another that lets central command provide some tailoring to local markets or different audiences. Let your imagination soar. It's another evolution in entrusting the power of marketing with the people who are closest to the audience. Plenty of links worth a look and bookmark. And I appreciate her understanding what social marketing is and isn't. Look for lots more mainstream brands to get involved in partnerships and social marketing in 2007. Downloading and listening to or watching music, videos and television programs with iPods, MP3 players and yes, that ol' reliable desktop, has crept up from 7% of internet users to 12% in the past 6 months according to the Pew American Life and Internet Project. For those who look for 'divides' the data point to differences in podcast use among men and women (15% vs 8%), those 64 years and younger vs 65+, and those with 6+ years of online experience vs those with 3 or less years. Note: NO significant differences among age groups until 65, NO significant differences among educational levels, and NO significant differences among household incomes. Data on the race and ethnicity of podcast users was not reported. Interestingly, users with broadband access were not significantly more likely to download podcasts than internet users with dial-up connections (14% vs 10%). A Business Week 'news analysis' on 'What Podcasting Revolution?' asks are they doing it regularly? [Only 1% on atypical day.] But that should be no surprise: who in their right mind is going to download podcasts regularly through their broadband or dial-up internet connection and then transfer the file to a player (the iPod two-step) on their way to work or school? Remember that time is our most precious personal resource. The reporter is also looking for the mass market appeal of podcasts, seemingly oblivious to the idea that the power of podcasting is narrowcasting or slivercasting by and for people of like minds for their own communities, not creating the next RCA. Her nut is: As more bloggers produce professional podcasts, such content will become a greater competitor to television and other forms of media. But podcasting has a long way to go before it poses a serious threat. For your own programs, do not believe in the mass market appeal of podcasts. Focus on developing and delivering content that allows people to participate when and where they can at their convenience. One great value of these new media is that you do not have to expend a large amount of resources to reach everyone at one space and time any more; you can learn to aggregate listeners and viewers over time at very low incremental costs to your program. That's the communication insight from The Long Tail. Podcasts should make audio recordings (and purchases) of conference presentations extinct in 2007. Every major presentation made at your organization or institution, especially by outside experts, should be a podcast that any employee (and us interested 'outsiders') can listen to and appreciate later (if you invite us in). Any important internal meeting whether it be programmatic or administrative is a podcast for dissemination to others. And then you can think about producing educational and entertaining podcasts that are generated by and for your audiences when such tactics make sense from both behavior change and audience perspectives. The one thing you won't have to worry about is that you are automatically contributing to the widening of digital divides. And a note to the readers who get diffusion theory: that's a 71% increase in 6 months in podcast adoption and closing in on the 'take-off' target (aka the tipping point). What do you suppose will happen to podcast usage as the iPod 2-step is displaced by wireless downloads to your cellphone - and especially when the automobile makers begin to incorporate such technologies into their new models? The first wave of Phoenix’s Video GAMERS (Game Advertising & Measurement Evaluation Research Syndication) study used 1,502 online interviews from active gamers equally split between males and females (18 or older) to determine which brands were recalled the most—Phoenix classified an active gamer as someone who has played a video game on a recent console or portable in the last 30 days and has either rented, purchased or received a game in that time frame. The study found that 42 percent recalled advertising from within a game. So which brands topped the list? In no particular order: Nike, Adidas, Reebok, Coke, Pepsi, Mountain Dew, Gatorade, Ford, BMW, Samsung, McDonald’s, KFC, Burger King, and Axe. Perhaps not surprisingly, gamers who played sports games and racing games were more likely to remember in-game ads. After all, games in those genres are far more conducive to product placement than other titles. The study found that 54 percent of gamers who played a sports title recalled some form of advertising. In fact, four out of five of the top games for in-game ad recall were sports titles—FIFA World Cup, NHL 2K7, Madden NFL 07, NBA 2K7. The one non-sports title to make the top five was GTA: San Andreas. The investment for this study is $7,500 per wave. It would be interesting to see groups interested in the public health impacts of other forms of digital entertainment marketing explore this area in more detail. The ubiquity of the advertising is what begins to make it effective at the behavioral level, and not just in changing awareness or recall of the message or product. Finding ways to apply Critical Social Marketing to these applications, digital media literacy programs for consumers and other forms of counter-marketing are important areas to explore before 'cheating' and moving only at the public policy level. Chasing down marketers for unhealthy products must feel like Whack A Mole at times. On average, consumers are four to six times more likely to feel that traditional media is more trustworthy than emerging news sources [Internet user groups, blogs and chat rooms] for news they feel is most interesting. Top pick news topics of interest (each selected by approximately a third of consumers) included entertainment, hobbies, weather, and food/cooking. Following closely was sports, selected by roughly two-in-ten consumers. For entertainment, consumers most often picked traditional lifestyle media as the most trusted source. However, Internet blogs, user groups and chat rooms were selected next most often, followed by weekly or monthly general interest and news magazines. Radio came next, with special interest or topic-specific Internet sites following to round out the top five. In line with America’s concern about weight and health, the survey identified that food was selected as a topic of interest nearly twice as often as politics/elections (29% vs. 15%). One thought about these results is to look at what the competitive topics are for news in the general population and, by inference, you can draw some conclusions about what news outlets are looking for. If you work with news media you should be familiar with how they divide their news space into 'holes' for these various topics - often based on their perceptions of what their audience is most interested in watching, reading and hearing. And note how media consolidation, reduced news room staffs and smaller ad revenues are leading to the shrinking of news holes. One of the tricks for earning media coverage has been not to just get 'my story' into the competitive space for its news hole, but how to leverage the story and its coverage to get into other holes as well - that's when you hear about a product, service or idea 'having legs' from a media POV. For example, when people talk about edutainment, they are describing how they leverage the entertainment hole for other purposes. Note that the hole is a valuable concept to apply to the audience and their predispositions to certain types of topics as it is to the media itself. I've been speaking about social media and social marketing to a variety of groups (more to come on that). Both in the talks, as well as in some posts here, I have been using corporate examples and the few nonprofit and government examples I can find to demonstrate that innovation in using social media is alive and thriving. 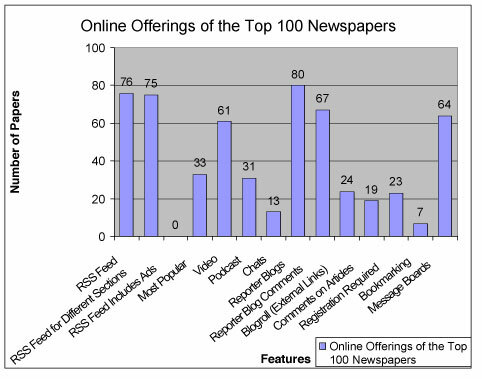 The Bivings Report investigates the use of social media by the top 100 newspapers in the US. There is an assumption that newspapers have the most to fear from social media, a fear that is echoed by people in my audiences who work for government agencies. Yet, fear can either motivate or paralyze action. What's interesting about the results for me [click on the image to enlarge it] are the variety of social media being experimented with by 'the old media', as well as their relative popularity. One constant question among the folks I talk with is 'where do I start with using social media?' I don't think there is a pat answer other than to ask and explore 'what are you trying to accomplish and how would adding one or more social media to your marketing or communications mix help your organization get closer with your audience and to that goal?' But here is another source for benchmarking the process for yourself. PIOs pay particular attention. Read the full report [pdf file]. A lot people have been talking about the Pew Internet and American Life Project study of bloggers. For some POVs, see TechNews World, BuzzMachine and Neville Hobson. BottomLine: some good descriptive statistics demonstrating a very complex and growing enterprise (note to those in the early majority: it's passed being a fad). What is another interesting form of social media are podcasts; interesting because while they may be 'social' in allowing more people to simply and inexpensively generate content that the world can tap into and take with them on their MP3 player, they are a creator-centric (command and control) media. 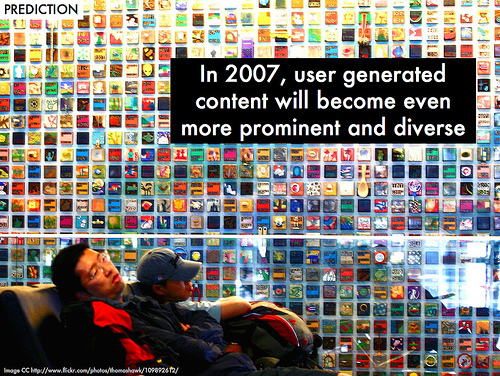 Users cannot interact (yet) with the content - it's listen and learn. This property of podcasts is one reason why Federal government agencies have picked up on them (National Institutes of Health, National Institute of Nursing Research, Agency for Healthcare Quality and Research) and not blogs (hint: turn off the comments to your blog and you've created a text version of a podcast). Among people who download podcasts, 72% download an average of 1-3 week while the heavy users (10%) download 8 or more/week. The report also notes some of the uses podcasts are being applied to, including making class lectures available on college campuses [example]. For more information about podcasting try these sites for starters: Podcasting News, Podcasters Wiki and 20 Ideas for a Great Podcast at FrogBlog. After the advergaming report released last week, the good news/bad news is that there are plenty of other marketing activities on the web that you can investigate. Advergames were an obvious target, especially when you choose to focus on food companies in these days of the war on obesity. How many children actually go to these sites and spend as much time on them as adult researchers do is the unanswered question. If you enjoy thinking about how to incorporate advertising, games and entertainment (and immersion or engagement) into your programs, or are curious as to where marketing minds are going, these sites will provide you with some inspiration (or perspiration). Interested in reaching the online gamer culture? Try out Xfire (N=4.7 million) and read some of their advertising case studies and a review at Resonance Partnership. I've written about Neopets (N>70 million) before, but it's a good reference point before heading over to Whyville (N=1.7 million). Finally, a preview of the first retail store opening in Second Life (N ~ 350K) is at the MIT Advertising Lab and get some information about the American Cancer Society's Second Life Relay for Life fundraiser. Guess some people may need to revise their ideas of what constitutes an audience's everyday life. One of the overriding responses to my presentation on Social Media and Social Marketing at Clearwater Beach was surprise that so many 'adults' were involved in new media. One of the user stats I quoted was that 40% of MySpace audience was over the age of 35. Then there are the findings about political blogs where the largest age group of readers is between 41-50 years old. The Emmys have also recognized that it's not just about youth and entertainment. The latest award category is for news and documentaries produced for websites, mobile phones and iPods - hardly a 'Y&E' category. And for those who worry about the 'old' media, take comfort in the fact that 5 of the 7 nominees are newspapers - the Washington Post and New York Times. "The traditional networks, if they send somebody out to do a story, essentially their priority for the moment is to service their primary outlet of television," said Westin, a former ABC News executive. "Newspapers, I think have always wished they could be in television, but they didn't have a television network. 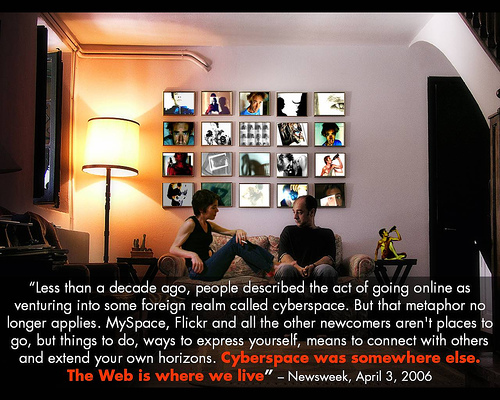 Now they essentially have one: it's called the Web." For all the government agencies and nonprofit organizations who have always wished for their own screens, look no longer. CBS News has a series of special features on GenTech. Lots of usage data and features including MySpace (complete with a tour of a profile), gaming and trends using a variety of media and interactive formats. A good place to enjoy learning about the teen audience and new media. And the good news is they conclude that the kids are all right. What Are the Effects of Media on Child Development? That could have been the subtitle for the briefing and panel discussion convened by the Kaiser Family Foundation on the release of their latest report The Media Family: Electronic Media in the Lives of Infants, Toddlers, Preschoolers and Their Parents [news release, full report]. This national survey, supplemented with focus groups, of parents with children between the ages of 6 months and 6 years documented the extent of young children’s exposure to screen media (TV, videos/DVDs, video games or computers) and offered a panoramic view of how media fits into the everyday lives of these children and their parents. The results come after 15 years of expanding commercial interest in programming for the youngest viewing audience traced by one panel member to the success of “Barney.” The profits from the character’s licensing fees, along with an increasing awareness of the importance of the first years of life in brain development, was the impetus for the development and promotion of various products, especially videos and CDs, to ostensibly improve intellectual development and other types of cognitive skills. [See the review of evidence for educational claims by commercial media products and the site for ‘the nation’s first channel for babies’ for a quick orientation as to where we are today.] However, as became clear during the panel discussion, there are only a few studies that give us any insight into how media exposure and use is affecting (positively or negatively) children’s cognitive, emotional and social development. And a review of the literature concluded: there is very little evidence to suggest that children younger than 2 learn anything useful from television. The position of the child programmers and network executives was, in their own words, ‘the train has left the station’ and people need to understand that children’s exposure to screen media was not going to go away. So the best thing to do is develop content that is educational and, they repeatedly emphasized, stimulates interaction between the parent and the child – though in the next breath they admitted that very few parents actually did this (2/3’s of the survey respondents reported that they watched TV with their child ‘all’ or ‘most’ of the time - interacting with them is another question). The physician on the panel was the champion for ‘live’ interactions between parents and children and while not recommending zero tolerance for screen viewing (except for infants < 1 year old), was much more cautious in his appraisal of the unknown and possibly untoward effects of screen viewing behaviors [see the current recommendations of the American Academy of Pediatrics]. The backdrop for much of this interest in early childhood exposure to screens is the recognition that the years 0-5 are crucial for brain development. This massive, uncontrolled social experiment of using screen media to help parents manage their schedules, keep the peace and provide a backdrop for other activities of daily life such as eating and falling asleep, is taking place in a society where very few public research dollars are devoted to investigating the effects of this ubiquitous social influence on the early development of values, knowledge, language skills, cognitive and social skills and behaviors. A review of the research by ZERO TO THREE found no research on the impact of TV viewing on early childhood development and some studies that have noted an increase in the potential for negative effects as viewing time increases. That the assumed positive effects of exposure to content teaching academic subjects has had very little support only magnifies the finding noted by the PBS representative that parents place even more value on content that involves social-emotional learning and teaches values when choosing programs and other content for their child to watch. For social marketing and education programs aimed at very young children and their parents, these results and the ensuing discussions have raised my awareness that simply ‘buying into’ using screens as part of an intervention is not an excuse to ignore the possible negative consequences of our actions. We need to learn how to use media in new ways and not simply fall into the traditional, and unsupported, ways of doing things. Welcome to the latest trend in Japan - Grand Cyber Cafes (with media immersion pods) pitched to various segments of teens and young adults covered by the NY Times (graphic by Yuko Shimizu). The mind reels at the possibilities. It is 'the beginning of the end of television as we know it' declares a study from the IBM Institute for Business Value. Our analysis indicates that market evolution hinges on two key market drivers: openness of access channels and levels of consumer involvement with media. For the next 5-7 years, there will be change on both fronts – but not uniformly. The industry instead will be stamped by consumer bimodality, a coexistence of two types of users with disparate channel requirements. While one consumer segment remains passive in the living room, the other will force radical change in business models in a search for anytime, anywhere content through multiple channels. Added Link: How ABC TV is confronting the problem of content mobility.